Blue Heron c1940! Pet-Friendly Cottage w/ fenced yard! Screened porch! Completely restored 1940's cottage with high ceilings, claw-footed bath tubs and shower, hardwood floors and large sunny windows. Large master bathroom shower. Large screened porch, completely fenced-in yard, corner lot with lots of space for playing. Next door to beautiful Dutton-Waller Cottage, this home would be perfect for two families who want to be close. Complimentary high speed wired internet and WIFI. 2 blocks to Alley 3 kayak launch area, 2 blocks to A-J's DocksideRestaurant , 5 block walk to the beach and The Breakfast Club. Great street for bike riding - located on desirable Chatham Ave.
Pet-friendly- multiple pets welcome! Back yard also features an outdoor sink to clean fish! We have a fabulous master bathroom shower! The shower alone is worthy of a reason to come and stay here and enjoy this cottage!! 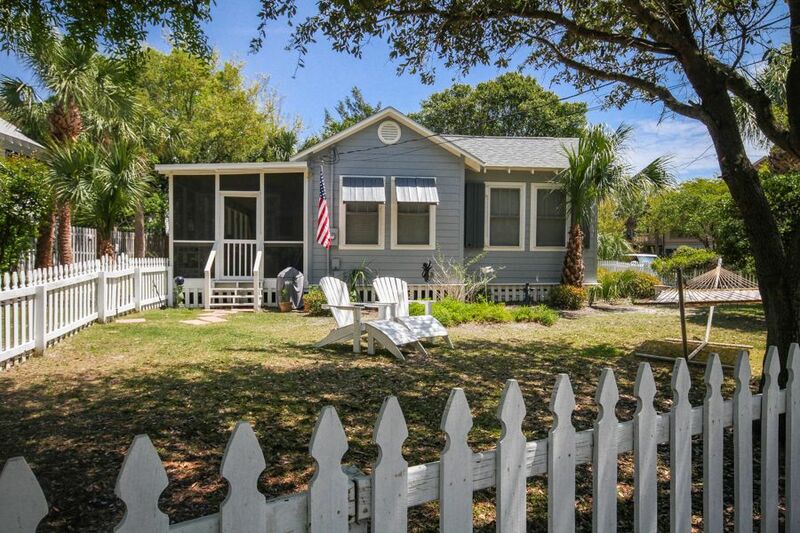 Blue Heron cottage has just the right mix of rustic and modern to make a week at Tybee Island comfortable and beachy. It's wonderful to be near the Alley Street access to the River Inlet, and the walk to the beach is an enjoyable 5 blocks. The Mermaid hospitality staff goes above and beyond to make its guests happy, and they are always friendly, just like everyone at Tybee. The long screened porch with 3 ceiling fans, couch, and table to feed 8 or more, completes the relaxed spirit of the cottage. Life stresses are all forgotten at the Blue Heron. This is our 5th time staying in a Mermaid Cottage and have loved them all! However, Blue Heron really was special. The location was only 5 blocks to the beach and we rode our bikes there every day. The house was so clean upon arrival and the mermaids were great in getting us a couple of items we needed. Blue Heron is very spacious, the decor is super cute, and the shower in the master was incredible! Once again, we had a fabulous stay on Tybee Island. Thanks Mermaid Cottages!!! Mermaids make for a Happy Beach time!! Renting a beach getaway with Mermaid Cottages the best! From the great customer service and response to any issues that may need attention to the overall service from the time of arrival to departure is top-knot! Tech concierge on call and condition of cottages always very good...Mermaid Owner also treats her guests like family! I return to Tybee as frequently as I can as I am a former resident of Savannah. You can't find quality and service any better than Mermaid Cottages! Blue Heron was wonderful! The biggest perk was how much roomier it was than the pictures make it look. The living space is HUGE. We were all able to spread out and get comfy. The master was great, with the shower being a plus -- overwhelmingly big, in a good way. The kids loved having their own beds and not having to share like they are often forced to. It was an easy, flat 5 block walk to the beach and the use of the beach wagon was great. Loved the fenced yard and available pooper scooper for the pup. And it was so clean when we arrived, so inviting! The mermaids even checked in with us on day two to make sure all was well. When we return to tybee we look forward to working with them, and maybe staying at Blue Heron, again. My husband, one-year-old daughter, and I had the privilege of staying at The Blue Heron cottage for 5 glorious days. Simply put, we are in love. It had everything we needed and more and THAT SHOWER...absolutely lovely. It’s close to the beach but in a quiet part of the island, perfect for our little one. The kitchen was great for cooking and preparing everything we needed for our daughter. We hope to return very soon! Ask about our special off-season rates!